Sooo I’m recently in a crazy addict Pinterest phase. 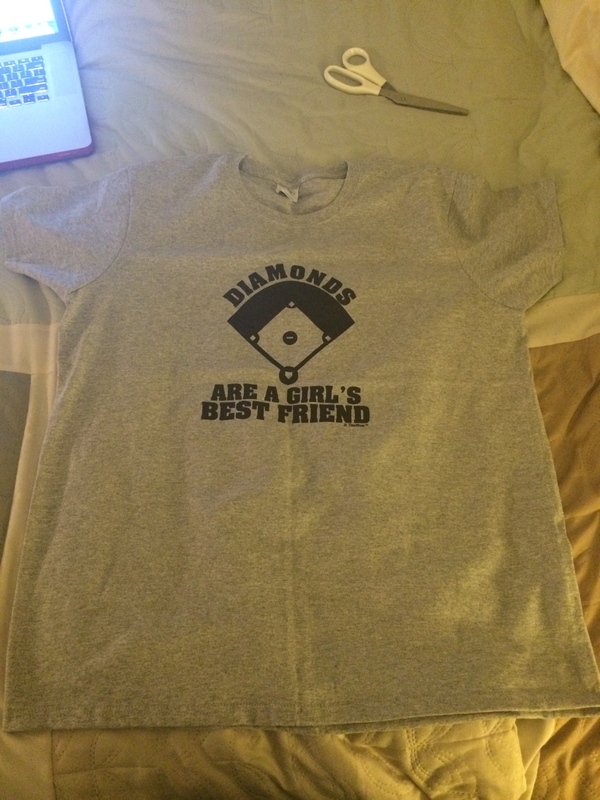 A couple of weeks ago I did two things ordered this super awesome shirt from Amazon that says ‘Diamonds are a girl’s best friend” with a picture of a baseball diamond (I love baseball) and I came across a tutorial on t-shirt cutting. I had no idea at the time that these two things were meant to happen just days apart from each other. I was on Amazon and saw the previously mentioned awesome shirt and couldn’t wait for it to arrive. When it did get here I was all sorts of excited and then I opened the package, barf! I’m all for unisex shirts and such but please don’t market a shirt for women as a women’s shirt and then send me a big, baggy, unisex shirt. I swear when I first put it on it looked like I was wearing a giant potato sack… not cute. After committing to return the shirt, I started the return claim and all I remembered that my good buddy Pinterest just had a tutorial for refashioning or t-shirt cutting whichever suits your fancy. 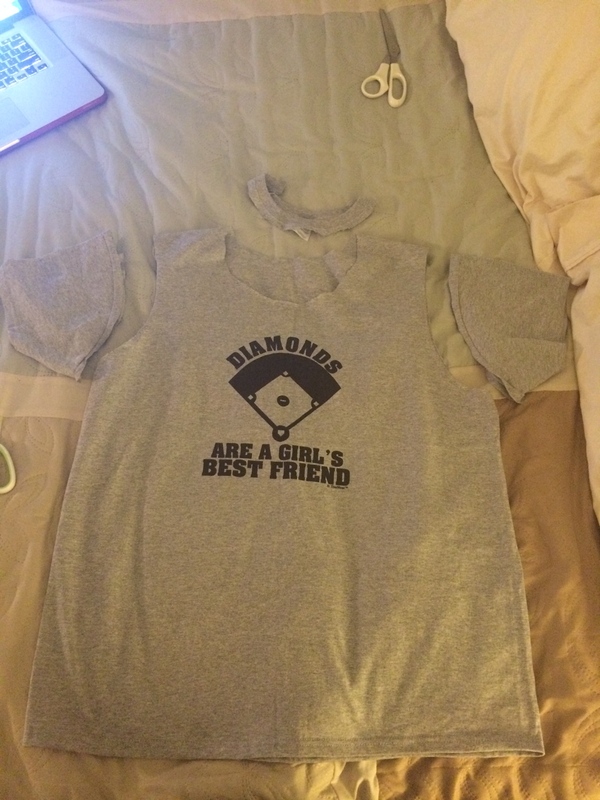 I decided that it really wasn’t worth the time or the effort to mail the shirt back so I decided to take a go at the t-shirt cutting, if it was a terrible job the shirt would become a sleep shirt or a gym shirt. I have to admit it was suuuuper simple, the only suggestions I might make are to make sure that you wash the shirt before hand; I believe the blogger mentions that but of course I didn’t do it. Also make sure that your scissors are sharp, I started out the project with dull ones and ended up with this weird scallop-esque pattern that really bothered my OCD so I had to take sharp scissors and clean it up a bit. Oh one more thing if you are super perfectionist just cutting without marking will kill you, I know it happened to me; one side looked shorter, or deeper or whatever so I eventually gave in and used a light colored felt pen to mark where I wanted to cut more of the shirt off. And because I got carried away and didn’t take pictures of the rest of the project you cut the bottom hem of the shirt off to use for tying later. Cut the neck as deep as you like, and cut a big V shape in the back. I know not the best instructions but I promise if you go to the link for the tutorial I read she explains it much better and with pictures!! 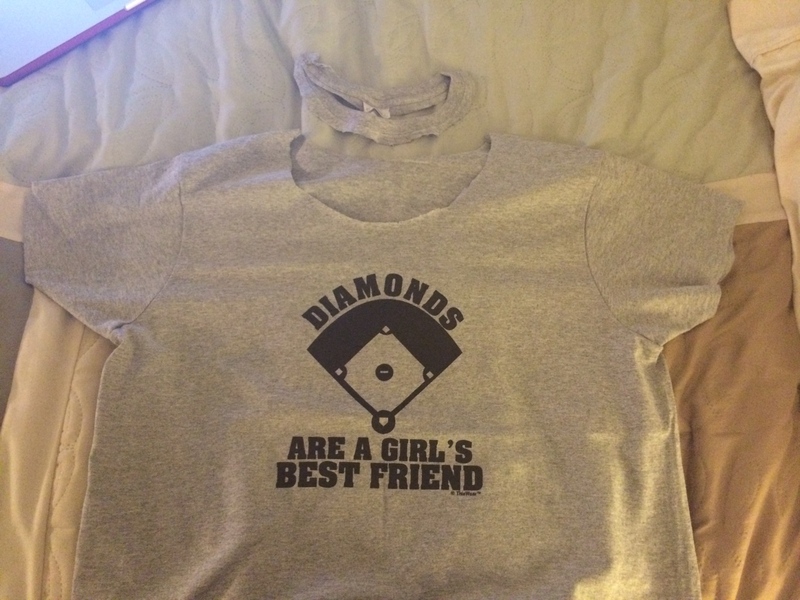 So I snipped here and there and finally came up with something that I was happy with, as of right now it is just a being lazy around the house shirt but I am not totally against wearing it to a summer day baseball game. And this is the back.. yes I forgot to take a front picture, but I promise the back is the most exciting part. 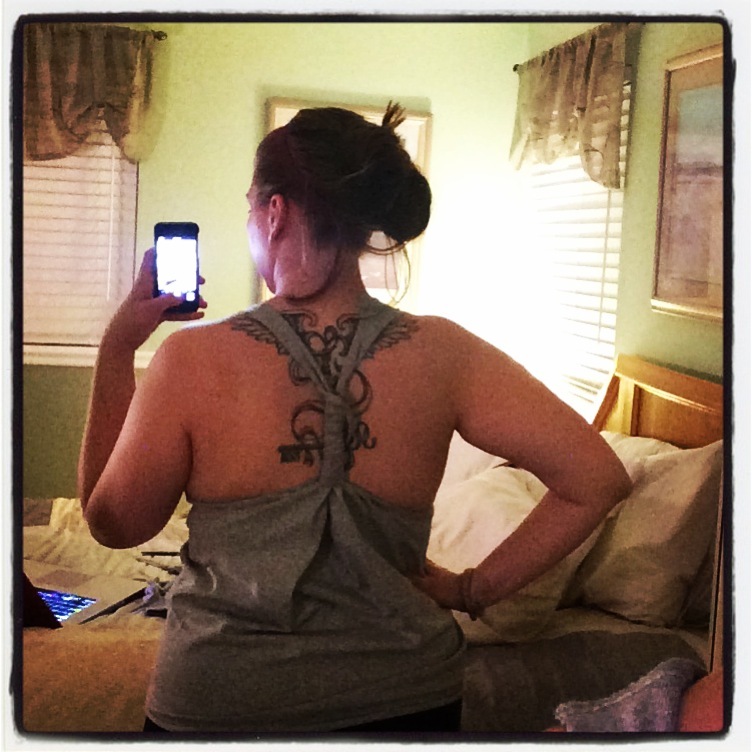 So my once frumpy, unisex shirt is now a little more fitted for my body and the back looks super fun. Have you refashioned anything that was not exactly to your liking? Show me.